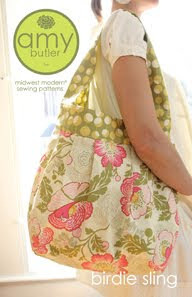 I made the Amy Butler Birdie Sling for my Mother -in-law, she chose the colors and fabric, fantastic Amy Butler choice don't you think? 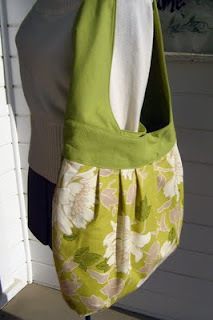 I enjoyed using this pattern, it took some time but the finished product is well worth it, the bag is lined and has fusible fleece inside so it has a nice weight to it. The strap is one piece so it fits nicely on your shoulder and you don't have that one pesky strap that always falls off to deal with. The strap looks nice. You're getting a lot of mileage out of that mannequin for your pictures. Looks good.